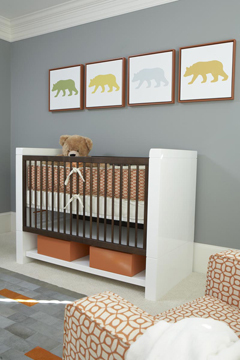 A modern baby bear theme nursery in bright colors including orange, blue gold and green designed by Karen Hott Interiors with photos by Lauren Rubinstein. I planned for the modern bear baby nursery theme to be as far from a traditional teddy bear themed room as you could possibly get and still have..well, bears! The artwork featuring our large, furry friends as the subject sets the tone for the space. Each of the four framed prints features an identical bear silhouette. One in green, one in gold, one in baby blue and finally at the very end, another one in yellow. There are no black or brown bears included whatsoever other than the cute toy bear peeking over the edge of the baby's crib. 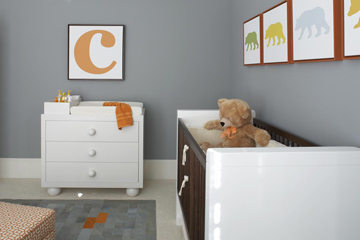 This space is definitely not the classic teddy bear nursery and certainly not a bear nursery that is so popular in rustic settings. There are enough hints toward the nursery theme to still call it "bear" but only in the most contemporary sense of the word. There are no earth tones unless you consider gray, orange and the above-mentioned colors to be earthy. There are also no rough textures, just sophisticated patterns and furnishings with sleek lines that are truly age-less. Everything used to decorate the room is just as appropriate in a room designed for an adult as it for a child. I say "everything" because even the crib is convertible into a bed and most of the items are either relatively child-proof like the lucite side table or they are out of reach like the glass shelves. This style is not everyone's taste but for parents that visit Unique Baby Gear Ideas looking for something edgier than a classic Winnie the Pooh nursery; this may be just what you've been searching for. I am going to do something similar only with polar bears and a color scheme with shades of blue. Great room. Where did you get the crib bedding? What is this paint color? Love it! What type of crib and dresser is set called?? 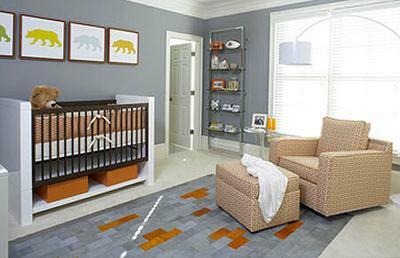 Btw Great work on the nursery ,gorgeous ! Where can I get this chair and ottoman?